GLUTATHIONE, a naturally occurring protein, is called a peptide. It is composed of three amino acids: glycine, glutamine and cysteine. Cysteine contains sulfur and gives glutathione its sulfuric aroma. It also plays a major role in glutathione’s antioxidant and detoxification functions. With its anti-inflammatory properties, glutathione is considered a “key antioxidant” in the functioning of cells. Antioxidant means it helps prevent oxidative stress. Glutathione plays a critical role in defending cells again this oxidative stress. Therefore, a deficiency of glutathione plays a key role in aging and many disease states. 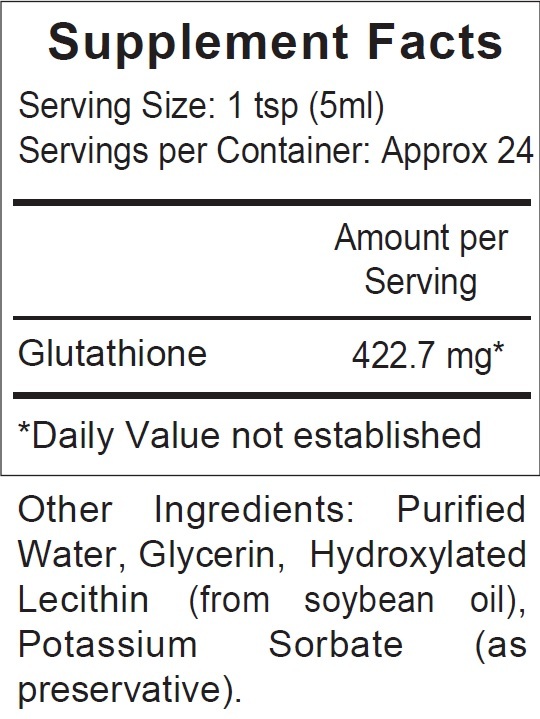 One teaspoon contains over 420 mg of reduced glutathione. Lecithin - The liposomes in ReadiSorb Glutathione are derived from lecithin. The lecithin is an extract of soy oil, not protein.